In last month's newsletter we discussed diffusion. This month we continue on this theme with a discussion on the effective diffusion coefficient. A couple of calculators are also given which provide you with different methods of calculating this coefficient. What is the effective diffusion coefficient? The effective diffusion coefficient takes into account the fact that diffusion can only take place through pore openings because mineral grains block many of the possible pathways. How is the effective diffusion coefficient calculated? Where Dd' represents the effective diffusion coefficient, Dd is the bulk diffusion coefficient, and w is some scaling value that accounts for the structure of the porous medium. How does the physical properties of the porous medium effect the effective diffusion coefficient? There are many different physical properties of the porous medium that can effect the effective diffusion coefficient, the most obvious being porosity. The effective diffusion coefficient will increase with increasing porosity, as there will be less media to prevent the movement of the ions. In addition, depending on the nature of the porous media, the species may adsorb onto the mineral surfaces, decreasing the diffusion as well. What are some example values of the effective diffusion coefficient? The effective diffusion coefficient varies significantly depending on the nature of the porous medium, and the species diffusing itself. Bulk diffusion coefficients for some ions in water are given below; these would then have to be scaled to account for the presence of the porous medium (taken from Domenico and Schwartz, 1998). Where µ is an empirical value less than one, and n is porosity. Where æ is tortuosity, which will be discussed in the next newsletter. Groundwater Vistas is a groundwater flow and transport model that can be used to simulate the movement of contaminants, via advection, dispersion and diffusion, in the subsurface. In next month's newsletter we will discuss tortuosity, which is a value describing the path of the water through the porous media. 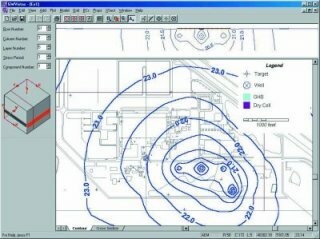 Groundwater Vistas (GV) is a sophisticated Windows graphical user interface for 3-D groundwater flow & transport modeling . GV couples a powerful model design system with comprehensive graphical analysis tools. Developed by the author of ModelCadTM, GV is a model-independent graphical design system for MODFLOW MODPATH (both steady-state and transient versions), MT3DMS, MODFLOWT, MODFLOW-SURFACT, MODFLOW2000, GFLOW, RT3D, PATH3D, SEAWAT and PEST. New Model Versions: GV5 will support PEST Version 11, MT3DMS Version 5, MODFLOW-SURFACT Version 3, MODFLOW2000V1.17, and MODFLOW2005.